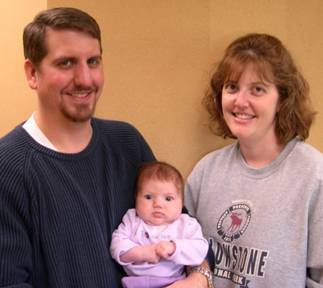 Josh, Lauren, & Carolyn H.
My name is Carolyn H. I came to Abundance Acupuncture in April 2006 because my husband and I were having trouble getting pregnant. Based on the opinions and diagnosis of Western medical doctors we were both sub-fertile. I had fertility issues for one year before seeing David Milbradt and intense PMS for at least the last 5 years. Our fertility issues caused me intense frustration and sadness. PMS sometimes lasted two whole weeks before my period and made me very irritable, bloated, and also caused breast tenderness. I also had irregular spotting before my periods which lasted up to a week. My doctors couldn’t explain why. These issues caused fatigue, depression, irritability, and hopelessness. They made it difficult for me to enjoy the company of dear friends and family members who all seemed to get pregnant without “trying”. I tried medications such as Clomid and chiropractic. Clomid gave me the worst PMS, accompanied by rage that I had ever felt. Chiropractic care continues to help me with over all health but wasn’t helping infertility. I began to feel significant improvements in my condition after three months of treatments. My unusual spotting prior to periods stopped! My PMS symptoms were reduced in intensity and duration. We found out I was pregnant on December 10th and I am overjoyed! Although all my symptoms did not get 100% better my overall health improved so greatly that with Dr. Dave’s help and herbal supplements, we got pregnant naturally. During the treatments I felt relaxed and peaceful. There were treatments during which I literally felt energy move from place to place. It was so interesting. The clinic is very clean and comfortable and the staff is friendly and always willing to help. I would recommend acupuncture to women with PMS and menstrual cycle irregularities and couples experiencing infertility. It is a gentle effective way to harmonize how your body functions as a whole. I would also recommend reading the book The Infertility Cure by Randine Lewis which explains how Acupuncture and Oriental Medicine helps infertility problems. I feel that David Milbradt is a very conscientious practitioner who was always working on making my treatments “just right”. Acupuncture and God’s grace allowed us to avoid invasive Western medical fertility interventions, which in themselves had less than favorable odds of working. My name is Tina Kasper. I came to Abundance Acupuncture in August, 2008 because I had been trying for over a year to get pregnant and I felt it was time for our 3 year old son to have a sibling to play with. I also felt tired and was very stressed out. I had pain in my feet, hips, and back. I was worried about my fertility at age 36, but I was amazed and delighted to become pregnant after one month of treatments at Abundance Acupuncture. I have also had significant improvement in other symptoms like my headaches, colds, hip and back pain. During the treatments I felt relaxed and peaceful. The clinic is very calming and the staff is so caring! I would recommend acupuncture to anyone with fertility issues or chronic pain because it is a great holistic approach. I feel good about my experiences at this clinic and the wonderful results! P.S. 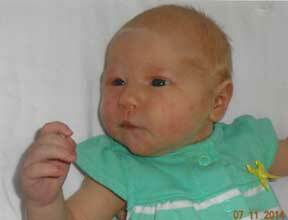 My husband and I were very pleased and delighted to welcome Emily Marie Kasper to our family on June 10th, 2009. 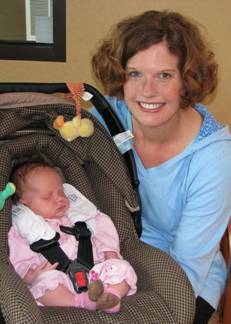 She was born with lots of hair and a healthy weight of 9 pounds! Hi. My name is Marybeth and this is my story. Not long after my husband and I got married, we started trying to get pregnant. (We’re no spring chickens you know.) It didn’t take long when I found out we were expecting. 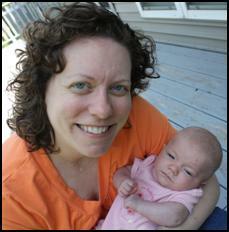 Ten weeks into the pregnancy I miscarried. After waiting the customary three months, we started trying again. Getting pregnant the second time wasn’t quite so easy. After a year of doctor visits, ovulation predictor kits and months of Clomid, we decided to give acupuncture a shot. Just weeks after starting treatments, I felt a difference in my body. I knew when I ovulated – something I wasn’t in touch with before. We were pregnant after my first cycle. Shocked is an understatement. I was sure YES on the stick meant yes, you’re NOT pregnant. I couldn’t believe the change in my body happened so fast! I think even David was surprised at my results. My acupuncture experience was extremely positive. It was relaxing and therapeutic. My blood pressure went down, my personality changed. Family noticed I was less stressed and more easy going. And oh yeah, pregnant! Our experience with Abundance Acupuncture was very fulfilling. The staff is knowledgeable and caring and most certainly has your best interest at heart. I recommend acupuncture for fertility issues to anyone who’ll listen. I don’t think our new addition would have happened without it! I plan to return when we’re ready for number 2! Hope to see you there! I came to Abundance Acupuncture in July of 2008 with one thing on my mind: babies. My husband and I had only been trying to get pregnant for six months or so, but I was already stressing about my age and how long we might have to wait. We are both healthy and at the time I was only 35, but the thought of my cycle starting up again month after month of trying to make a baby was starting to cause me undue anxiety. Unfortunately, I knew this was, simply put, part of the problem. I had complete faith going into it that acupuncture could help, and I just didn't want to wait a year or more to conceive. We had not tried any 'conventional' fertility assistance, because I had no interest in regulating my body on a regular basis with hormones. Yuck. My first impression of the clinic was the friendliness of the staff - the last thing it felt like was 'clinical.' Fresh flowers brought the front area to life and my initial consultation with Dr. David was pleasant and enlightening. We began acupuncture and then a course of Chinese herbs to, I think David put it "tonify my yin" - we were off. I noticed changes in my PMS and menstrual course from the very first: less cramping and less hyperirritability: bonus! Per David's recommendation I was taking my Basal Metabolic Temperature every morning and watching the changes in actual temperature readings on a weekly basis was entirely fascinating and inspiring. It was like seeing visual proof of the treatments at work! When my husband got back in October (after about four months of my treatments), I ovulated a week later and bam! I felt pregnant from the get-go. Not wanting to be too cavalier about my intuition, I kept taking my temperature every morning and it only went up when my cycle was supposed to start. I had waited a solid two weeks before buying a home pregnancy test and was delighted with the results. Needles to say, we were in a family way! Now I am eight months pregnant and my little critter is big and healthy and we look forward to meeting him in a month or so. My husband and I are entirely pleased with our Abundance Acupuncture experience. Abundance Acupuncture has helped me with a number of different health concerns: frequent headaches, Premenstrual Syndrome, and fertility issues. The headaches and muscle tension in the neck and shoulders started over 9 years ago. Whenever I was stressed out I would get increased tension which would lead to a headache. Then I would get stressed out because I had headaches, which would lead to more headaches, and it became a vicious cycle. When I was taking birth control pills I had headaches every day, but even after I got off of the pill I had headaches at least twice a week. They were worse before my period and whenever I was stressed out. I went to the doctor and they gave me an antidepressant which worked for the first year or so and then it stopped working. Then they tried increasing the dose for a few weeks and that didn’t help so I stopped taking it altogether. I ended up taking Advil and tried relaxation techniques and yoga. When I started having acupuncture I was really hoping that it would work because I had tried so many other things… Now I know that it works. I had a wonderful response to the acupuncture treatments and I noticed improvements right away after the first treatment. The biggest difference I saw was the relief from the tension in my neck and shoulder. The tension used to be there all the time but, now if I feel some tension I notice it right away and I can usually relax it before it builds up. I’m overall more relaxed than when I started treatments and because of that I don’t seem to worry about things as much as I used to. My Premenstrual Syndrome started when I had my very first periods and I was miserable seven to ten days before each of my periods. With the treatments I noticed a number of changes in my monthly cycle. I stopped feeling nauseous when I ovulated. I had less PMS irritability, water retention, and breast tenderness. I didn’t have the headaches, my cramping was reduced, and when I did have the cramping it was gone right away with the treatments so I didn’t need to take any medicine…which was nice. Actually since I started with the treatments I haven’t needed any medicine at all. Even the cold I had was alleviated by the acupuncture. My husband and I were trying to have a baby and we had a number of concerns about our fertility. Through acupuncture I relaxed my body so it was more accepting to getting pregnant. In any case it worked! I’m pregnant! The clinic has a very comforting atmosphere and I felt that everyone who worked there all wanted me to get better.